Winter is the time we rely on our windows to keep the cold air out and the warm air in. Sadly (and coldly) this doesn’t always happen. When cold weather comes, thousands of you will be asking, “Why are my windows cold and drafty? There can be many reasons for air infiltration leaks in windows. A decent window with Low-E insulating glass (U=.33) will still allow about 4 times the energy loss compared with the insulated wall next to it. (R=12 or U=.08). To improve window thermal conductivity change the glass or add a Low-E film to the glass. If you feel air infiltration coming around the window frame on the interior side, you are probably feeling what is known as “cavity air” (air inside the wall). To fix this type of window air infiltration, caulk the interior perimeter window with paint-able latex paint and put gaskets behind all cover plates on electrical outlets and switches. If a window is not square and level in the opening, gaps can occur between operable parts (sash) and fixed parts (frame). These gaps can allow excessive air infiltration and make your windows cold and drafty. If you see uneven gaps around sash, you might need to have the window reinstalled level and square, which might also involve recaulking. 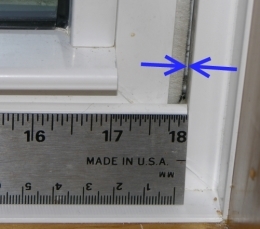 If, even after squaring the windows, drafty gaps still exist between sash and frame, you may need to replace the weatherstripping with a larger version. I begin to explore this subject in #9 below, Window weatherstripping and gaskets. The wood-clad window industry uses the term “accessories” for the various strips of metal that are used to transition between adjacent windows (mullion connectors) and also around the edges of the windows (trim extenders). These accessories usually have a little returned edge that snaps into a groove in the window – the accessory groove. When these accessories are snapped in to their groove, they look neat but beware, the tight fit does not repel water or air infiltration. 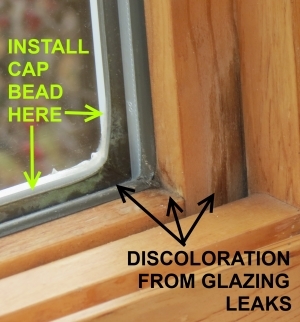 In my experience, wood-clad window manufacturers and installers often fail in the task of sealing the accessories to the window. This is especially true at the “mullion connector”, which is a U-shaped channel that connects adjacent windows to one another. 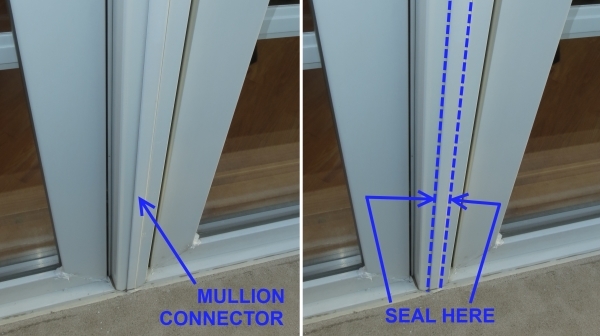 To fix this source of air infiltration, seal all edges of vertical and horizontal mullion connectors to the window. It is not easy to do this neatly, so use a skilled caulker and the best silicone caulk. 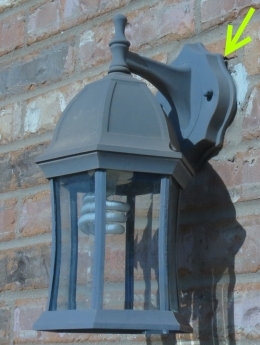 Unsealed light fixtures, electrical outlets, exhaust vents and pipe penetrations on the outside of the building can bring cold air and even water into the wall. This cold air then flows through the wall and finds the easiest path into the building, like an unsealed interior seam around the windows. That air will be a draft you feel when sitting in your rocking chair next to the windows, spoiling the prosaic scene. Why do you think granny had a blanket on her legs? Yes, it’s true. It is because of window air infiltration. On aluminum windows cold air in the wall cavity can also chill the frame and increase chances for condensation. 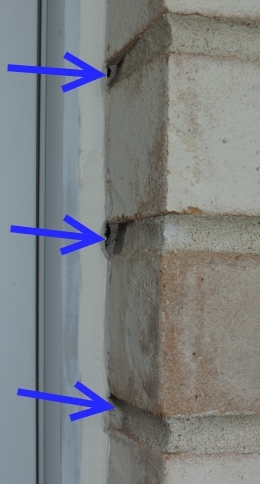 To fix excessive air infiltration in the wall cavity which can easily come through the windows, have a skilled caulker inspect and seal all penetrations in the exterior walls. To fix that crazy amount of air infiltration, use caulk between mounting flanges of the air conditioner and the adjacent part of the window or wall. If a double hung window sash is raised in order to receive the air conditioner, take extra steps to seal the top edge of the lower sash to the face of the upper sash, first with an expandable foam followed by the best duct tape available. Seal nooks and crannies with silicone caulk. Now we have arrived at what I really want to talk about. 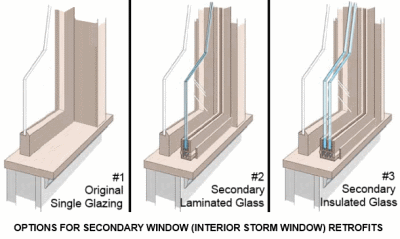 Window weatherstripping and gaskets are the strips between operable and fixed parts of the window. When the sash is closed, these are intended to be compressed, blocking the flow of air leaks through the building. When these are worn or missing, you can lose far more heat, and feel far colder near the window, than from any other cause. Attacking this problem takes some skill and knowledge, but the benefits can be huge. Windows that slide like double hung windows, sliding windows and sliding doors use fuzzy weatherstrips that allow the sliding motion while maintaining a seal. These are called “sweep weatherstrips” or “pile weatherstrips”. Windows that compress their weatherstripping, such as casements, awnings and hopper windows use compression weatherstrips, also called gaskets. These window gaskets are usually compressible bulbs of various shapes. 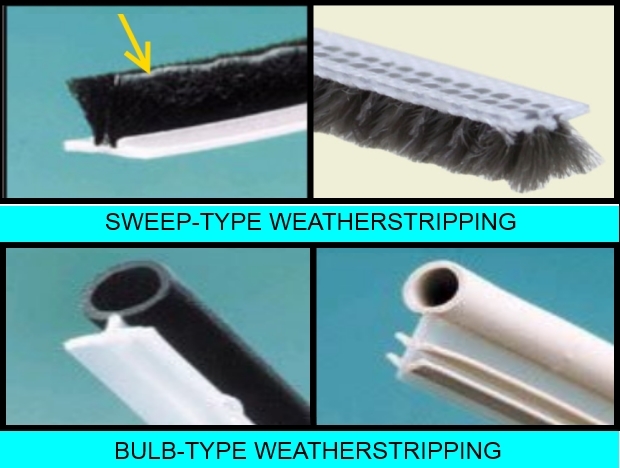 Sweep weatherstrips, used on hung and sliding windows and bulb weatherstrips, used on casement, hopper and awning. Tip left image shows a plastic fin embedded in the pile for a better seal. Air Sealing – Seal air leaks and save energy! View looking down at our area of the lab from the top of the test wall.